River Bend is an upscale designed three-level log cabin with six bedrooms, five bathrooms, and a game room with pool table and card table located in Smoky Ridge Resort, a log cabin community. For those looking for the feeling of being nestled in a natural wooded setting overlooking a river with a peaceful setting, this cabin is for you. This beautiful log cabin is within walking distance to the swimming pool and situated with convenience to Pigeon Forge, Wears Valley, and the Great Smoky Mountains National Park and is within 10 minutes of area attractions. For those looking for relaxation to enjoy the scenery, the covered main level back deck offers wooden rockers and tables, and a partially covered wraparound main level deck with two wooden rocking chairs and wooden table, hot tub, and a gas grill. This elegantly decorated log cabin is accented with a stone electric fireplace, two in room Jacuzzi’s, fully furnished kitchen, and all the luxuries for your home away from home. River Bend is perfect for your families, group retreats, or reunion getaways in the Smoky Mountains. Please see availability on the calendars below and tap on Reserve Now for more availability and booking. We had a wonderful time staying in this mountain home! It was very spacious and met all of our needs. Kelli and Dee were wonderful to work with and very friendly! 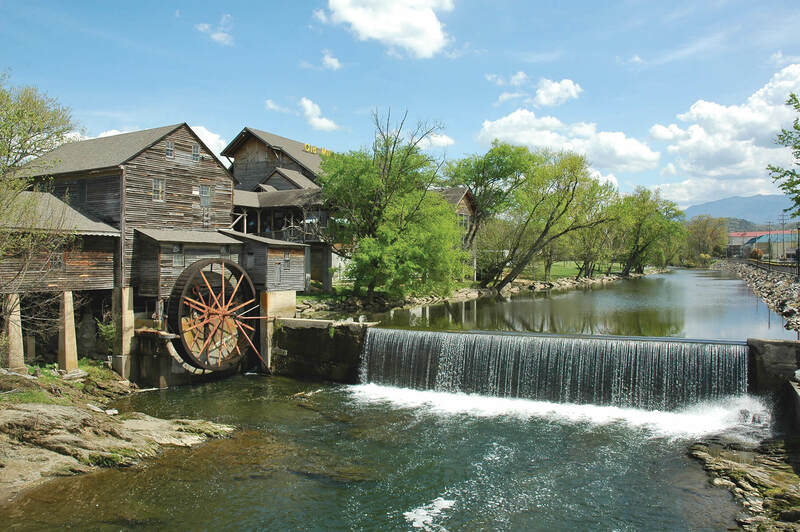 It is located very close to all of the Pigeon Forge attractions. We ate at the Old Mill Pottery House Cafe and Grille which was very close and it was wonderful as always. I would recommend this beautiful home and setting to anyone who truly wants a luxurious mountain getaway! We visited Wears Valley the week after Xmas, and had a wonderful time. The cabin is beautifully decorated and well constructed, as well as clean and well-stocked for a crowd. Kelli was easy to get in touch with, and even checked to see that we had arrived safely and that everything was as we had expected it to be. The location is just a short drive into Pigeon Forge, with the new Kroger easy to get to. I would highly recommend this spot; we can’t wait to visit again. We enjoyed the cabin with a total of 6 couples…. The girls watched movies and went shopping while the guys enjoyed hiking, games of pool, and football. We ate all of our meals at the cabin, making use of the grill and the kitchen. This is a great location… Close to shopping and grocery – we plan to make this an annual event! We had a blast! We arrived at the cabin with 6 touring motocycles with trailers-the driveway is not large enought for all the bikes but we found plenty of parking near by. Cabin was better than we thought it would be.Very clean and comfortable.Every one enjoyed there stay and we will rent this cabin again sometime. We had a family of 10 stay at the cabin for a week. We had plenty of room and loved the cabin. We had a couple of issues which were taken care of right away once we contacted Kelly. Dealing with Kelly and Dee was awesome. They were so friendly and helpful. The cabin was everything the details showed. We were about 15 minutes from pigeon forge but loved the mountain atmosphere from the decks. We will hopefully stay there again in the future and would highly recommend this cabin. We would recommend Wood Grill Buffet and Mel’s Diner for dining both located in Pigeon Forge. We enjoyed a day at Nascar Speedpark in Pigeon Forge,,,everyone had fun on the go carts and huge arcade. We went to Ripley’s Aquarium which was loved by everyone from 1 yr to 69 yrs old. We played putt putt at Ripleys McDonalds course but our favorite was Hillbilly Golf. We rode a car to the top of the hill and played 18 holes of golf on the side of the mountain. It was a great scene and so much fun. We also love the tram up the mountain then ski lifts to the top of the mountain. And have to mention that we also enjoyed sightseeing. It will definitely be a vacation we take hopefully every other year. Everyone we came in contact with were so nice and welcomed us to their business. We stayed here for New Years. There were about 6 couples. We had a wonderful time and had plenty of space. Very clean and decorated very nicely! Sign up for our newsletter to receive the latest news, events, updates and more.